There's a long way to go over the next 45 days and 72 years of movie history; and I hope you'll forgive me if I start it off with a bit of scene-setting before the review itself, even though the story I'm about to tell is extremely well-known. Walter Elias Disney had a perfectly American life story: born to a middle class family in Chicago, raised in the rural Midwest in the kind of postcard small town that features so prominently in the most rosily conservative nostalgia for the simple days before World War I; a self-taught artist who became an animated film producer in the 1920s out of necessity almost as much as anything; a creative genius who sunk the last of his money into an animated mouse named Mickey who became the most famous movie start of the 1930s and turned his creator into the most famous name in American entertainment in the span of just a couple of years. Of course, much of what we know about him has to be decoded from the squeaky-clean official history that the company which bears his name would prefer that we all believe, but the speed and thoroughness of Disney's rise from a Midwestern kid to one of the most powerful men in Hollywood is impressive by any measure. If Disney had one crippling flaw that haunted him throughout his career, it's that he was an atrocious businessman. Before Mickey Mouse hit, Disney had already raised and lost one studio, and managed to piss away control of Oswald the Lucky Rabbit, his previous blockbuster star. It's easy to forget, since these days the Walt Disney Corporation is a vast, money-sucking force for pure evil, that Walt himself was always more interested in making things that were entertaining; though he certainly didn't avoid wealth, he tended to always sink whatever profits his most successful films made right back into another movie - it's for this reason that his studio was perpetually on the cusp of bankruptcy well into the 1950s. The key to Disney's artistic and commercial success is that he was always first motivated to make what he personally wanted to see; thus he was passionate about everything that came out with his name on it, rarely making something just because it could be made. I bring this up more than anything because of an extremely important moment from Disney's youth, when as a 15-year-old he attended a screening of Famous Players' 1916 version of Snow White. The young man was deeply impressed by this fantasy, and never forgot about it for all the years that followed, and when, in the early 1930s, he had become a huge important movie mogul, he decided to make a version of the Grimm fairy tale all his own. Adapting fairy tales into animated shorts was no big deal; the Disney animators had done so numerous times in their Silly Symphonies cartoons (the artsier cousin to Mickey's vaudeville), and there was even a Betty Boop Snow White made in 1933. But Disney didn't want to make a Snow White short - he wanted to tell that story, so important from his childhood, using all the powers he had at his command. He wanted to tell make it into a feature-length animated film; something that had never been done in America, or been done anywhere in the world with cel animation. For most of the mid-'30s, everything the Disney Studios did was focused ultimately on that goal. The Silly Symphonies became a laboratory for new techniques, from Technicolor to better and better character animation, to the hugely elaborate and groundbreaking multiplane camera, which allowed backgrounds a degree of depth previously unthinkable. And all this experimentation, not to mention the laborious process of creating the feature itself, was taking its toll: all the countless piles of money that Mickey Mouse shoveled into the company's vaults was being tapped, and if this feature failed, Disney's very successful studio would vanish overnight. People in the industry began to speak of the animated feature as "Disney's Folly", predicting a bomb like no-one had ever conceived of in Hollywood. Then in December, 1937, Snow White and the Seven Dwarfs premiered, and became one of the biggest smash hits of the Depression. Not for the last time, Disney saved himself from the jaws of his own idiocy through the simple expediency of producing a work of art; a movie simple enough that five-year-old girls the world over can sing the songs, and complex enough that no less an expert than Sergei Eisenstein declared it one of the all-time masterpieces of world cinema when he first saw it. A perfectly fair response: Disney's Snow White is one of the few movies in history that could honestly be described as "like nothing else before it" - and despite seven decades of imitations, many of them produced by the Disney Studios itself, there are only a tiny number of films that have come anywhere close to equaling its achievement. The film's success was so complete that for literally generations, it was the only feasible model for making an animated feature in America. Its visual style froze American animation dead in its tracks, and the only thing that got mainstream animation evolving again in any but the smallest degree was the discovery by U.S. filmmakers, in the 1990s, that Japan was apparently doing some animation, too. Even the story structure was copied slavishly: when Snow White was released as a musical, it was because fully a third of the movies coming out were either musicals or had musical numbers - but it formed a wildly persistent link between musicals and animation that led to nearly every animated feature until shortly before the turn of the century, whether made by Disney or one of their competitors, taking the form of a Broadway-style musical, years and years after that genre had completely died off in live-action filmmaking. And why not? Snow White and the Seven Dwarfs belongs to that impossibly rare company of artworks that effectively invented their medium and perfected it, all in the same breath. You could look long and hard for a cel-animated feature that makes such good use of the possibilities of the form without ever finding one (though you wouldn't have to look very far: the next two Disney features are arguably even better). 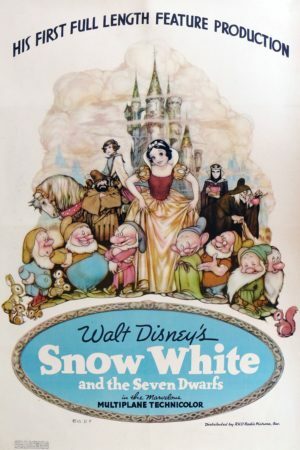 The animation itself does not represent that much of a leap forward over the work the Disney animators had done preparing for it; as far as pure craft goes, Snow White isn't that much better than , the painfully beautiful short from the same year that introduced the multiplane camera. In some ways, in fact, the high cost and stressful production of the film has some distinctly negative ramifications for the animation: some shots are more than a little bit jittery (revealed more then ever in the otherwise gorgeous new Blu-Ray of the film), and there are certainly points at which the animation of the human characters - the one significant advance made by this film - is stiff and unnatural. The character design itself is not always flawless, as both Snow White and the Queen both frequently look like their faces were chalked in roughly, particularly in wide shots. These are petty, nitpicking quibbles, though, in the face of what the film gets right. The design of the film as a whole is unimpeachable, particularly the glowing watercolor backgrounds (one of only three Disney features to use watercolors, impossibly), which really do give the film the appearance of an illustrated children's storybook that was undoubtedly the goal from the very beginning. It's a fairy tale after all, and never before or since has a movie fairy tale captured so much of the visual essence of what "fairy tale" means - whether in the rich textures of the castle that opens the film, the haunting nightmare imagery of the flight through the woods (a sequence that is certainly influenced by German Expressionism, yet not indebted to it), or the warmth of the dwarfs' cottage and the surround forest. A comparison with the 1916 Snow White is illuminating, given that for Walt Disney himself, the animated film was but a response to the original. The silent feature is a rather insipid thing, wasting much of its time in bland court scenes that have a fusty French tone rather than the medieval German setting of the Grimm story and the Disney film; and the silent also lacks any real sense of imaginative wonder, boasting visual effects that are clumsy and perfunctory even by the standard of 1916. It is pedestrian in all the ways that Disney's feature is grand and epic. The animated film, thanks to the multiplane and to the great talent of the background painters (backgrounds are frequently the best parts of Disney features, yet even so, few of them bettered Snow White), the scope of the film seems vast and deep, an endless countryside lying over the mountains and behind the trees. This is what traditional animation does best, to create another world so real and full and rich that it becomes truer than reality; this is what Snow White and the Seven Dwarfs does that makes it one of the very best films of the 1930s, and fully justifies Eisenstein's pronouncement that it was a masterpiece, and all of the millions of viewers that have loved it throughout the years. Even beyond the simple fact of its design, Snow White is an exceptionally well-crafted film for its era. Thanks to the limitations of hand-drawn animation - that it is very desirable not to create anything extraneous, given the labor involved in each and every frame - the film does not suffer from the herky-jerky editing that plagues even the best of the best Hollywood films of the time, and the story is achieved quickly and without needless padding. In fact, Disney's urgent desire to keep the story flowing resulted in fully-animated scenes being cut out of the movie before the actual painting and photography were done, a distinction it shares with virtually no other animated feature. And because of the work that went into every image, the "cinematography" - the composition of frames, the use of lighting effects - is as carefully considered as any other movie from 1937, and this is borne out all the more by the great amount of research and work that went into studying the ways that light falls upon objects, so that it could be recreated and augmented with all the care possible. And it hardly seems necessary to mention that the freedom of animation permitted the film to have a much more fluid camera than was typical of live-action. I could go into the story, the characters, and the music; except it seems absolutely frivolous to do so. 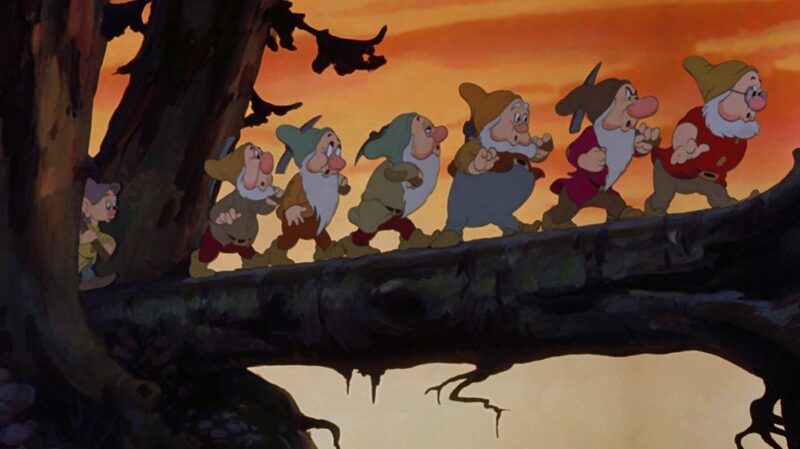 You don't need me to tell you that "Heigh Ho" and "Someday My Prince Will Come" are great songs, any more than you need me to explain why Grumpy and Dopey are among the most memorable supporting characters from the whole decade. This is because, in his passion, Disney made certain that the film would work as a movie first, and made sure it worked as an animated movie once that was achieved. So it is with the best American animation: the viewer forgets that it's animated, because it's so entertaining (watching the film for this review, having seen it dozens of times before, I was reminded of Truffaut's comment about The Lady Vanishes, that no matter how hard he tried to pay attention to how it worked as cinema, he always got too caught up in the story and forgot that it was a movie). This was always the guiding principal behind Disney's features, much more than the studio's shorts (which were always, unashamedly, cartoons); and it is a goal that was met in every way in this first film. A beautiful movie, terrifically funny, and a tremendously evocative depiction of the myths of childhood, Snow White and the Seven Dwarfs continues to work today for the reason it worked in 1937: it was made with all the love and care that could be poured onto it by a team of craftsmen being led by a man who rarely again gave so much of his own passion to a single project.